The first test was hooking up Apple's Thunderbolt Display, the only Thunderbolt display device available on the market today. Although I shouldn't have been, I was a bit surprised when the display just worked. Intel's HD 4000 drove the 2560 x 1440 panel just fine and there weren't any funny issues displaying the lower res UEFI setup mode. Despite Ivy Bridge being able to drive three independent displays, I was only able to simultaneously output to two connected displays on the GD80. All combinations of two worked however (TB + HDMI, TB + VGA, VGA + HDMI). Once in Windows, the Thunderbolt Display's integrated GigE, Firewire and other controllers started popping up. Unfortunately Apple doesn't offer a direct download package for Thunderbolt Display drivers. You can either hunt down the controllers/drivers on their own, or you can build a Windows Support (driver) package using a Mac and the Boot Camp Assistant. I'd much rather Apple just offer an easy route for non-Mac Windows users to take advantage of the Thunderbolt Display as it's the only TB display on the market, but I can understand the lack of motivation there. With the Boot Camp drivers installed, I got working GigE and Firewire 800. The Thunderbolt Display's integrated USB hub gave me issues however. Anything I plugged into it would either partially work (e.g. my mouse was detected but moving the cursor was far from smooth) or not work at all (e.g. my attached USB keyboard never worked). The other issue with the Thunderbolt Display is you get no brightness control, which can be a problem given how bright the panel gets. I've seen reports of people getting brightness control working via software tools but the solutions don't seem permanent. Apple's Thunderbolt Display definitely works, but Windows users will likely want to wait for a Thunderbolt display that is built specifically with Windows in mind. 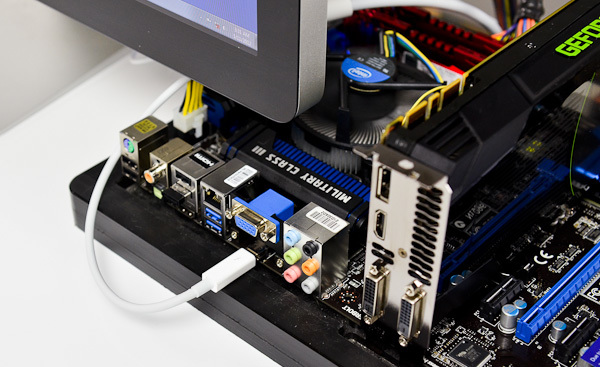 From a software perspective, Thunderbolt is treated just like another display output driven by Intel's processor graphics. I installed a GeForce GTX 680 along with Lucid's Virtu GPU virtualization software to see if I could use the 680 for gaming but drive the display using Intel's processor graphics and the Thunderbolt port. The setup worked flawlessly. Virtu recognized the configuration immediately once I had NVIDIA's drivers installed, and I was able to run the 680 headless - using only the Thunderbolt port to drive the external display. Intel's HD 4000 powered things in Windows, while the 680 kicked in for games. Sadly, the MSI GUS II is not that useful due to only supporting bus power (75W, no external power connectors supported). The fastest (nVidia) card it can support is the GT 640, which isn't that much faster than the integrated graphics it would be intended to replace. Anything faster can't be bus-powered. It would give you a small graphics upgrade over the Ivy Bridge integrated graphics, but not a big enough one to warrant all the cost and effort... and a notebook with discrete graphics could easily outperform it. If they add support for externally powered GPUs (anything that draws over 75W), then it could be something special. The product tag says the device can support up to 150w cards. See product tag picture here. I also have heard it has been reported there is no 6 pin power thus the device can only do 75w. Thing is though, even more important than power. Is the technology bandwidth. 10 Gbps (one-direction ) really is not that much in the way of graphics card bandwidth. As I recall. a 7600GT from a few years back, could chew through about 20Gbyte /s under intensive situations. So 10 Gbit/s is hardly going to put a dent into that. So with that in mind, we're basically stuck with integrated graphics performance again. That is, at least until the next iteration of the technology. Maybe. Of course it was the memory bandwidth.
" It has been proven that an x4 2.0 connection is sufficient for about ~80-90% of the performance of an x16 link in many gaming situations"
You would be very lucky to see half that. It is very likely, that you would see 25% or less of that. People have been working on this problem for years now. Through other means. 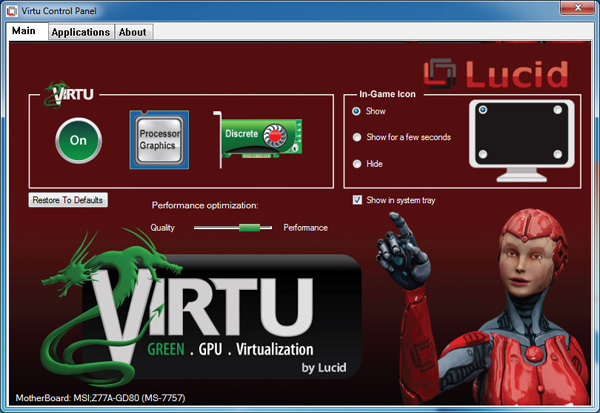 Partially, they have succeeded, using the MXM laptop graphics connection. At a cost that begs to wonder why they did not just buy a $2000 laptop to begin with. 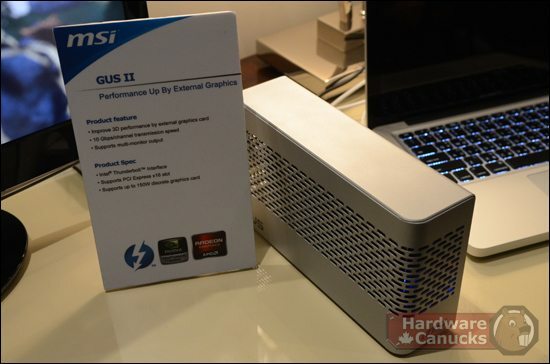 You can buy an external graphics enclosure, for laptops, right now. If you're willing to spend ~$800 for it. Then, only if you have the right laptop. So in ending I will say this. You're dreaming. You're dreaming a dream I have had myself. At some point however, you're going to have to come back to reality. Oh, one last thing. I should point out that Gigabytes, and Gigabits are not universal with one another. 10 Gigabit == 1.25 Gigabyte. That is, 25% more, than a PCIe 1x 1.0 connection can handle. Under ideal circumstances. Well, connecting a GPU via Thunderbolt doesn't affect the memory bandwidth, so that's not really relevant. Plus your math is way off. 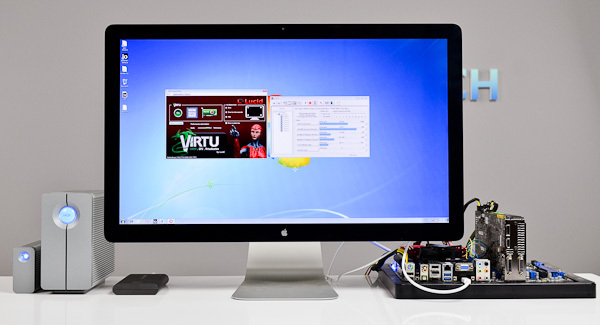 A single Thunderbolt controller can provide 10 Gbps of PCIe bandwidth. A PCIe 1.0 x1 connection provides 250 MB/s (i.e. 2 Gbps) which is 1/5 of what you get from Thunderbolt. Or put another way, Thunderbolt can currently provide the equivalent of a PCIe 2.0 x2.5 connection. DerPuppy is correct. If driver support with PCIe compression for Thunderbolt connected GPU's was available, we could achieve better than 80% of the real-world performance of a PCIe 3.0 x16 connected GPU with an external solution.